Our practice has been providing dental care to Dallas and surrounding areas for more than 30 years. We provide comprehensive dental care for the entire family from preventative hygiene to cosmetic dentistry. Our goal is to educate our patients and to be partners in the maintenance of healthy smiles. Our patients are our greatest asset and we enjoy the long relationships that we have built over the years. We value the trust that patients have shown in us and work hard to maintain this relationship. This is achieved by keeping patients fully informed during their visit, answering questions, addressing concerns, and ensuring both their satisfaction and comfort at all times. We are very grateful to be a part of the Dallas community and it has been our pleasure to give back whenever possible. We have enjoyed years of involvement and sponsorship in groups such as the Dallas Booster Club, Dallas Quarterback Club, Sounds of Summer Music Series, and the Polk County Fair Youth Livestock Auction. Dr. Woolsey, a Dallas High graduate, received his undergraduate degree from Willamette University. He then pursued his DMD training at Oregon Health and Sciences University School of Dentistry, graduating with honors in 2006. After completing his residency at the Portland Veterans Medical Center, he spent 2 years of service with the National Health Services Corps in Humboldt County, California. Dr. Woolsey has owned and operated this established dental practice in Dallas since 2010, having been able to work alongside Dr. Kolb until his retirement in 2014. 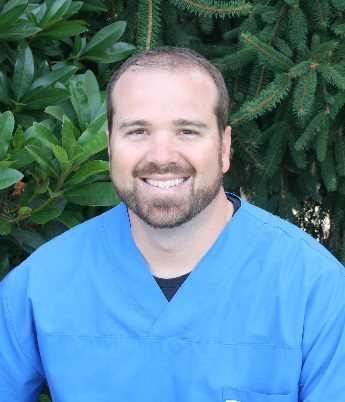 Dr. Woolsey is a member of the American Dental Association, Oregon Dental Association, Academy of General Dentistry, and the Marion-Polk Dental Society. He pursues continuing education in all aspects of dentistry, with a specific emphasis on general dentistry, oral surgery, implantology, and cosmetic dentistry. When he is not at the office he enjoys golfing, performing at Pentacle Theater, and spending time with his wife and 3 daughters.